490 p. : illus. : 25 cm. 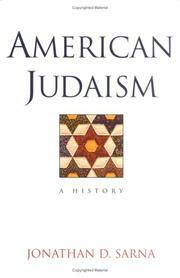 Chronicles the 350-year history of the Jewish religion in America. 100 ME:PersonalName 1_ $a Personal name Sarna, Jonathan, D.
245 Title 10 $a Title American Judaism. 300 Physical Desc __ $a Extent 490 p. : illus. : 25 cm. 520 Summary __ $a Summary, etc. note Chronicles the 350-year history of the Jewish religion in America. 541 Acq Source Note __ $d Date of acquisition 2006/02/17. 650 Subj:Topic __ $a Topical term Jews--United States--History.